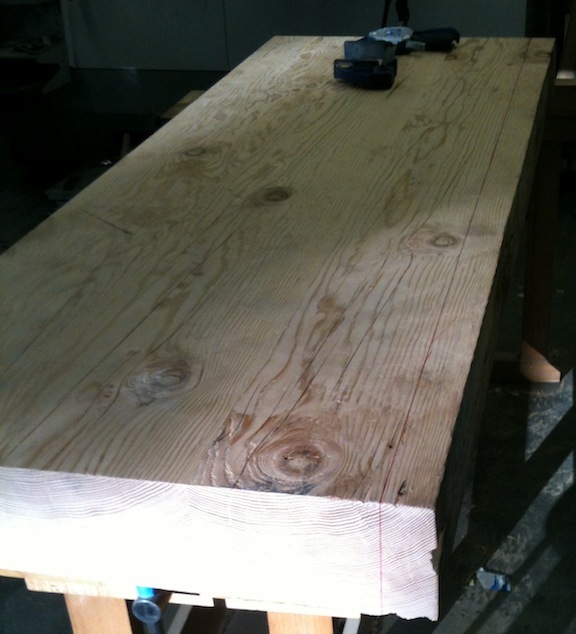 No, no one has taken advantage of me, but my workbench top is the right width now. 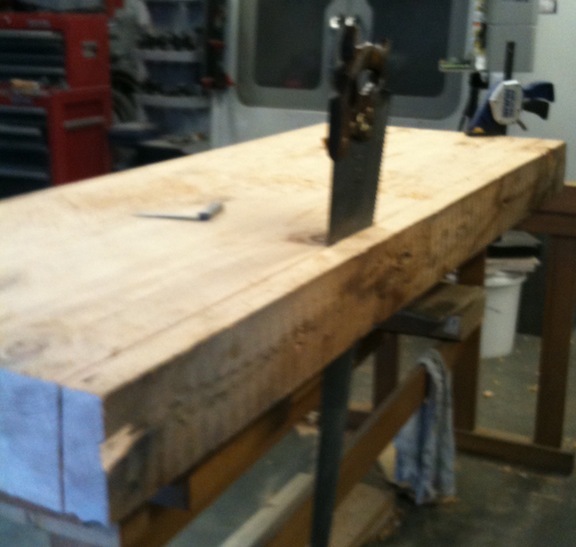 I cross cut the second end of the bench. Twice. The first cut I wasn’t happy with, so I laid out a second cut 1/4″ over. It was better, but still not quite perfect. I can track the line with absolutely no problem, but keeping the saw square to the face is eluding me. I suspect that it’s posture and practice. 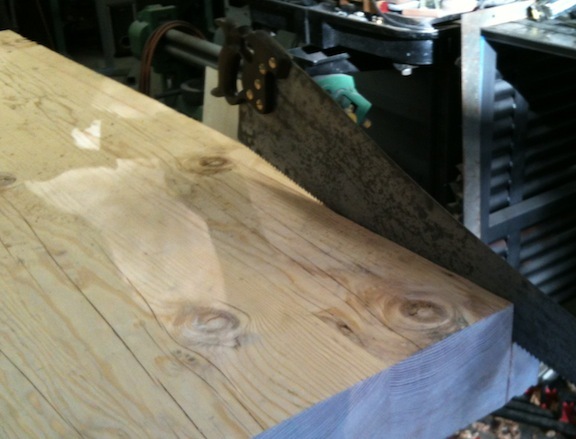 Cutting thick wood like this exaggerates the problem too. Then I laid out the long rip cut. I was pretty apprensive about this. I read on wkfinetools.com where Matt spent an hour ripping an oak plank so I kind of expected it to be a long, sweaty grunt. It wasn’t. I’m using a Disston D8 with the thumbhole handle that I bought from Mark at Bad Axe. It’s like 5.5ppi at the toe going down to 4.5ppi at the heel. It started easily and tracked really well. I could tell when I sawed through a big knot – the sound was a little higher pitched, but the saw plowed right through it without a hitch. As I cut I checked to see if I was holding the saw plumb — I wasn’t. I changed my stance and grip to try and correct it with limited success. I was only off a few degrees each time, but on a thick cut like this that is too much. More practice. One thing that was a HUGE problem is that my pseudo bench was wiggling around. It was ridiculous, and it’s definitely worse. I had to stop and take care of that before I went on. 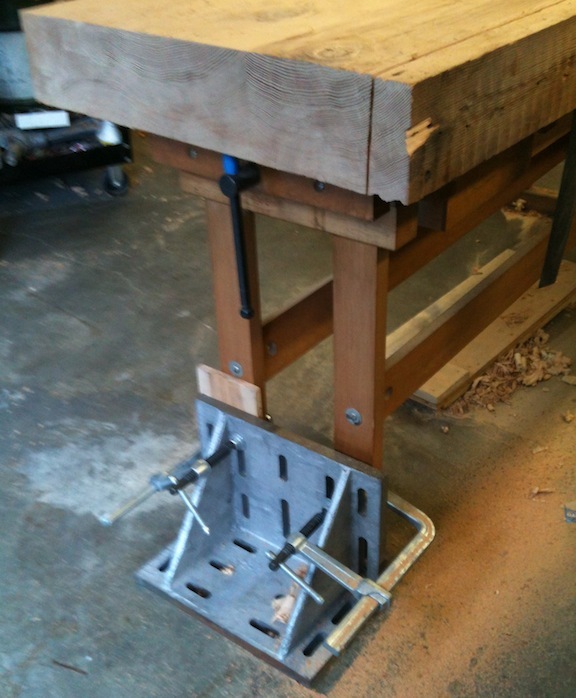 I thought about trying to cross-brace the legs but settled on using my giant angle plate again. This is a 150 pound hunk of precision ground cast iron. 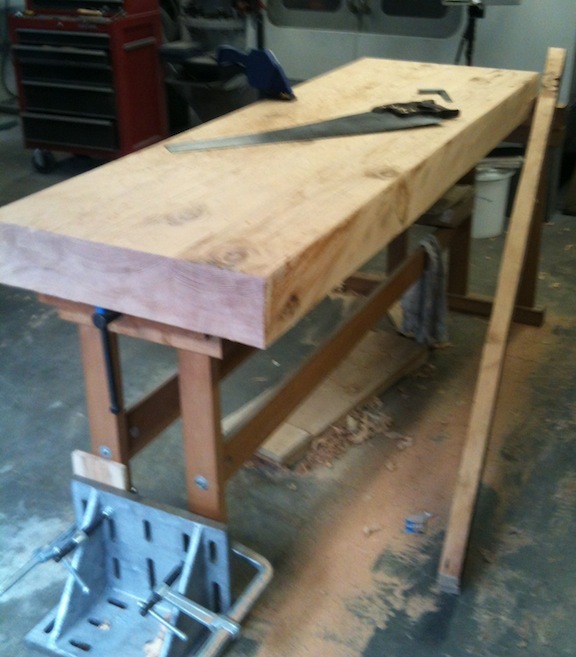 I clamped it to the pseudo bench and it tamed the worst of the wiggling and scooting. At least for the bench, my son is just going to have to grow out of it. In truth, this was much easier than throwing that #8 jointer around. I sawed at a steady pace, kept my grip loose and never broke a sweat. I tried some different hand grips and tried standing in a few different positions. I had time to try a lot of different grips. But before I knew it I had the cut done. It wasn’t hard, or an ordeal (or perfect). I have a date with my planes this morning to clean everything up before I flatten and thickness the last side of the bench top.